What was the customer’s Business Need/Challenge? Client is a commercial music streaming service providing free and licensed music and provides both Indian and international music content. To build a recommendation engine to suggest relevant songs to users based on their pattern of listening and choice of music. Client has a warehouse of more than 10 millions untagged songs, so we had to build an automation system to tag these songs by Genre, Male/Female Voice, Artist, Style etc. Helped client to automate tagging of Millions of songs and segment similar songs. Recommendation engine was built on top of segmented songs for personalized customer experience. 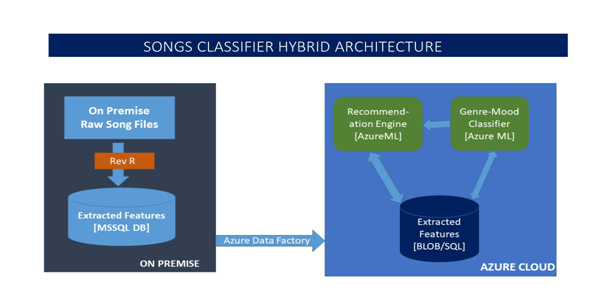 The songs dump was stored on blob, R was used to extract upto 60 feature and were then stored in Azure SQL. Based on user profiles and Genre of songs, a recommendation prototype was built using Cognitive Services Recommendation Engine.